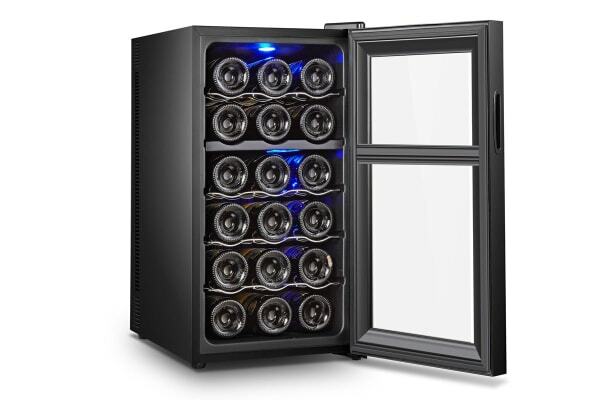 Better storage for your expensive vintages means more enjoyment in the glass, and this impressive 18 bottle wine cooler not only cools, but guards against vibration and light to help preserve your wine’s complexity and character. Heat is a quiet killer to fine wine. Too much humidity can make the cork dry out and shrink, letting the wine oxidise, while too much heat causes the wine to prematurely age. 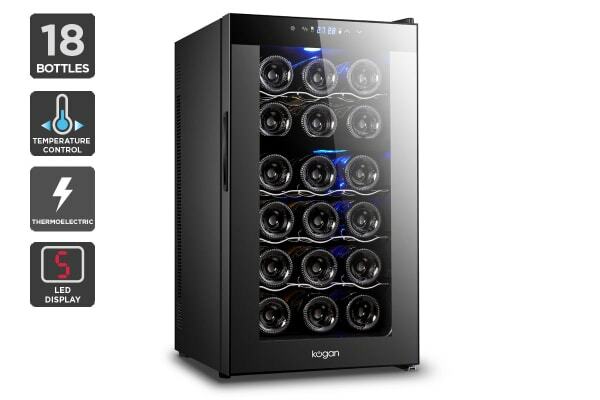 The Kogan 18 Bottle Thermoelectric Wine Cooler helps mature your vintages safely by customising dual temperature zones for your reds and whites in the one fridge, so your 17°C Burgundy Cabernet or 8°C Riesling is poured at the temperature to bring out their finer notes. Coloured wine bottles help reduce light damage, but invisible rays can still penetrate even the darkest glass. This sleek wine fridge uses a durable, tempered mirror glass door to help defend against harmful rays that can affect the taste, colour and aroma of your vintage. A rough, noisy compressor wine fridge can damage delicate wines by disturbing the sediment and accelerating the aging process. This thermoelectric cooler is extremely quiet and lets wines rest undisturbed in chrome-plated shelves that glide out smoothly without agitating your investment.